Just How Free Was Religious Life in the Early American Republic? Religious liberty, perhaps, is the key legacy of the Revolutionary generation. The new United States was a society where slavery was a growing economic force, gender inequality was becoming entrenched, and the new nation’s expansion relied on the exploitation and expropriation of Native Americans. If there was one freedom, however, on the march in the early republic it was religious freedom. The progress of religious freedom in the United States was also the progress of religion itself. “[T]he number, the industry, and the morality of the priesthood and the devotion of the people have been manifestly increased by the total separation of the Church from the state” noted James Madison, that famous advocate of religious liberty, in an 1819 letter. Religious freedom, then, is the American freedom. This has been the animating assumption behind most scholarship on the religious development of late eighteenth and early nineteenth centuries. Since the late 1980s historians and demographers and sociologists of religion have powerfully linked the end of officially established and state-supported Christianity with the rapid rise of evangelical Protestantism. With collapse of the colonial establishments “it became,” argues Nathan Hatch, “anachronistic to speak of dissent in America – as if there were still a commonly recognized center against which new or emerging groups defined themselves.” No longer were there insiders and outsiders of a religious consensus. American religious life was now rival competitors in a free market of religion earnestly battling to save souls. This is not to say that religion disappeared from American political life. The all-encompassing establishmentarian vision of politics and religion, where a single Church would guarantee the morality of the people through state sanction and support, collapsed. In its place arose a more splintered vision where morality would be enforced through reforming individual citizens by moral suasion and legislation. The vices of American life – prostitution, gambling, alcoholism, Sabbath breaking – would be checked on a case by case basis. There is a problem with this synthesis, however. There is a tendency to assume an easy separation between “religion” and “politics” – that each is its own obvious sphere and category. An established church is an inappropriate intervention of politics in the arena of religion and vice versa. As religious studies scholars have repeatedly argued this is simply not the case. Religion and politics are intimately intertwined. As questions of faith and spirituality move beyond the realm of individual conscience they raise a huge slate of political and legal questions. The physical landscape of what we think of religious space – churches, mosques, synagogues, community centers – are legal entities as well as physical ones. The boundaries of what separates “religious” communities from every other type of human community is political question ultimately decided, and regulated, by the state. My attention has, recently, been called to this interrelationship by Thomas E. Buckley’s powerfully argued and persuasive book Establishing Religious Freedom: Jefferson’s Statute in Virginia (2013). Establishing Religious Freedom is the capstone of Buckley’s long and productive career as one of the top political and legal historians of religion in Revolutionary Virginia. His central contention is simple: as with an official church, a regime of religious liberty must be established. Religious freedom does not emerge whole cloth after the collapse or abolition of a religious establishment. Positive steps must be taken to guarantee and enshrine religious liberty within a society. A regime of religious freedom, then, is just as political as its establishmentarian counterpart – contingent, complex, and often fraught with complications. The beginning of Virginia’s experience in establishing religious freedom is well-known but its consequences are largely forgotten. Jefferson’s “Statute for Religious Freedom” famously enshrined the voluntary principle, that all religious observance would be a matter of personal conscience, into Virginian law. Beginning in 1799 the Old Dominion’s legislature took this statute as its guiding principle in church-state affairs. What happened afterwards is spectacular, yet instructive. From beginning of the early nineteenth century churches would be denied the right to incorporate as distinct legal entities. This left churches, particularly institutionally intensive churches (such as Episcopalians, Catholics, and Presbyterians), economically and legally vulnerable. This set the stage, as Buckley notes, for a century of intense legal and political battles between (and within) Virginia’s Christian denominations over church property holding, the legal status of ministers, and the broader role of Christianity within Virginia society. The outcome was not particularly pretty. For religious communities, particularly institutionally intensive ones, Virginia’s vision of religious liberty, as Buckley tells it, “obstructed their efforts and ability to raise funds, construct buildings, establish institutions, maintain works of charity, educate their clergy and adherents, and carry out missionary activities.” The free market of religion in Virginia, then, was one in which the state took an active and aggressive hand. Denominations, such as the Baptists and the Disciples of Christ, with an institutionally light vision of church polity flourished in this favorable context. Institutionally deep denominations, like Episcopalians, floundered. Political competition was denominational competition and denominational competition was political competition. Buckley’s book syncs well with recent scholarship, such as works by Amanda Porterfield and David Sehat which is skeptical of the progress of religious freedom in the early republic. These historians have placed the state at the center of the story of religion in new United States. As the old denominational establishments fell a “moral establishment” arose in their place – through moral legislation and through the growing evangelical dominance of print culture. This body of scholarship argues that in the nineteenth century evangelicals seized the institutional and political center of religious life and pushed other groups – Catholics, free thinkers, Deists, and even non-evangelical Protestants – into the periphery. Evangelical dissent in America was reborn as non-evangelical dissent. Establishing Religious Freedom provides a case study of this process, by showing how Virginian evangelicals used state power to reshape their Commonwealth’s religious landscape into one favorable to their visions of Christian life. Establishing Religious Freedom, fundamentally, calls our attention back to the political nature of religion and contested nature of religious liberty in the early republic. Our common understanding of “religious liberty” as the American liberty tells us much about the history of the United States. It also, however, obscures the complicated and contested nature of that liberty. Too often our historical and public discourse relies on easy and clear distinctions between what is “political” and “religious.” Thomas Buckley’s scholarship, throughout his long career, complicates those distinctions. Establishing Religious Freedom is that wonderful historical work that calls readers to think about seemingly settled issues in new, contingent, and complex ways. Such work is doubly vital and important at a time where the discourse of religious liberty is being used in new, interesting, and disturbing ways. As quoted in Frank Lambert, The Founding Fathers and the Place of Religion in America (Princeton: Princeton University Press, 2006), 288. Foundational works include Nathan O. Hatch, The Democratization of American Christianity (New Haven: Yale University Press, 1989) and Roger Finke and Rodney Stark, “How the Upstart Sects Won America, 1776-1850,” Journal for the Scientific Study of Religion 28, no. 1 (March 1989): 27–44. Hatch, The Democratization of American Christianity, 7. The single best treatment of this process remains Robert H. Abzug, Cosmos Crumbling: American Reform and the Religious Imagination (New York: Oxford University Press, 1994). See also Bruce Dorsey, Reforming Men & Women: Gender in the Antebellum City (Ithaca: Cornell University Press, 2002). See William E. Arnal and Russell T. McCutcheon, The Sacred is the Profane: The Political Nature of “Religion” (New York: Oxford University Press, 2013). For this perspective in the context of the nineteenth century, see John Lardas Modern, Secularism in Antebellum America (Chicago: University of Chicago Press, 2011). Buckley’s career begins with the (sadly out of print) Church and State in Revolutionary Virginia and continued through a series of incisive books, articles, and chapters on the political and legal culture of religion in Virginia. Much of core of Establishing Religions Freedom is drawn and expanded upon from this previously published work. For his work on Revolutionary and early national Virginia see, among many examples: Thomas E. Buckley, Church and State in Revolutionary Virginia, 1776 (Charlottesville: University of Virginia Press, 1977); Thomas E. Buckley, “Evangelicals Triumphant: The Baptists Assault on the Virginia Glebes, 1786-1801,” The William & Mary Quarterly, Third Series 45, no. 1 (January 1988): 33–69; Thomas E. Buckley, “After Disestablishment: Thomas Jefferson’s Wall of Separation in Antebellum Virginia,” Journal of Southern History 61, no. 3 (August 1995): 445–480; Thomas E. Buckley, “The Use and Abuse of Jefferson’s Statute: Separating Church and State in Nineteenth-Century Virginia,” in Religion in the New Republic: Faith in the Founding of America, ed. James H. Hutson (Lanham, MD: Rowman & Littlefield, 2000), 41–64; Thomas E. Buckley, “Establishing New Bases for Religious Authority,” in From Jamestown to Jefferson: The Evolution of Religious Freedom in Virginia, eds. Paul Rasor and Richard E. Bond (Charlottesville: University of Virginia Press, 2011), 138–165; Thomas E. Buckley, The Great Catastrophe of My Life: Divorce in the Old Dominion (Chapel Hill: University of North Carolina Press, 2002). Eventually the statute would be incorporated in the Commonwealth’s constitution. 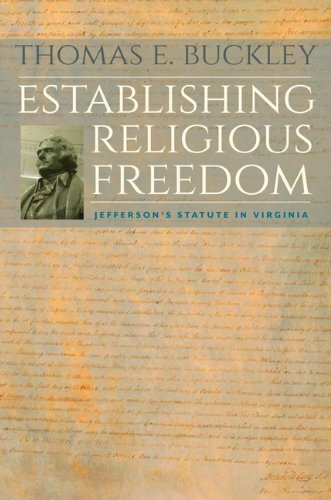 Thomas E. Buckley, Establishing Religious Freedom: Jefferson’s Statute in Virginia (Charlottesville: University of Virginia Press, 2013), 255. Contemporaries were well-aware of how important influencing the politics of religiosity was to the success of their particular denomination. Alexander Campbell, for example, played a key role in defeating attempts to allow the incorporation of churches at the 1829-1830 constitutional convention. See Ibid, 170-171. See David Sehat, The Myth of American Religious Freedom (New York: Oxford University Press, 2011); Amanda Porterfield, Conceived in Doubt: Religion and Politics in the New American Nation (Chicago: University of Chicago Press, 2012). This is a somewhat selfish paragraph because these are the sort of questions I am working on in my dissertation work. In my dissertation I explore religious institution building, particularly with the formerly established Episcopal Church, on the local level and its relation to the broader political-legal struggles within Virginia and Maryland. There is a growing scholarship on these questions for the former dissenting denominations, particularly the Baptists, but not for the formerly established church. For the evangelical experience see: Randolph Ferguson Scully, Religion and the Making of Nat Turner’s Virginia: Baptist Community and Conflict, 1740-1840 (Charlottesville: University of Virginia Press, 2008); Monica Najar, Evangelizing the South: A Social History of Church and State in Early America (New York: Oxford University Press, 2008); Jewel E. Spangler, Virginians Reborn: Anglican Monopoly, Evangelical Dissent, and the Rise of the Baptists in the Late Eighteenth Century (Charlottesville: University of Virginia Press, 2008). Thanks for the comment, Christopher! And for calling my attention back to Altman’s excellent piece.